Arslan and company reach Kashan, one of the outlying forts that have not been conquered by Lusitania. There, they attempt to convince Hodir, the fort’s ruler, to lend his aid to the prince. Unfortunately, Hodir wants to use the prince for his own goals, and stands to lose much if the prince’s plan of freeing the slaves is implemented. Ultimately, through trickery, deception, and straight-up violence, our heroes are able to escape from Kashan, but they are no closer to raising allies to assist them in retaking Ecbatana. This episode is heavily focused on what I assume will be a running theme for the show – having Arslan grow as a character through facing adversity. The episode has an almost vignette-like feel, opening with the group on the run from hundreds of cavalry they (apparently) intentionally tricked into chasing them, and ending with no change in their status, heading for yet another distant location. While it may seem like they accomplished nothing, it’s the changes being wrought in Arslan that matter, and it’s not a bad way to highlight these changes – so long as the show doesn’t do this so often that we lose track of the larger story. 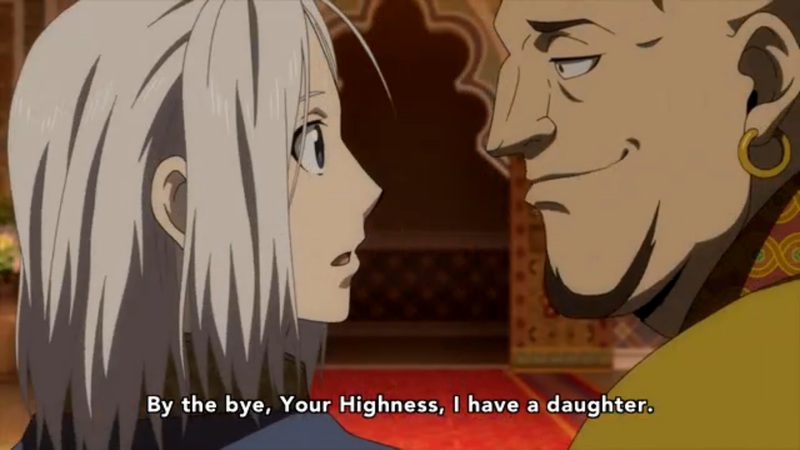 While this development in Arslan is good, the episode does have a few shortcomings. Hodir, the leader of the fort, is a cunning man who plots to have his daughter made queen by marrying Arslan. What a strange thing to bring up right after we’ve met, my trustworthy subject. When he hears of Arlsan’s plan to free the slaves, he decides to have Arslan’s companions killed so he can control Arslan once he is king. Arslan’s companions discover/anticipate this plot, and they are able to foil it, drawing Hodir out. Once his plan falls apart, he orders his men to kill everyone and capture Arslan, but his plan goes awry, he is killed, and the team escapes the fort unscathed. While there was plenty of action and cleverness going on, the overall plan doesn’t really stand up to scrutiny. Hodir’s plan relies on Arslan becoming King after marrying his daughter, but after murdering all of Arslan’s companions, why would Arslan ever trust him? If he just used Arslan as a figurehead (and so didn’t need Arslan to trust him), how would he ever succeed in placing Arslan on the throne? He certainly doesn’t have the troops, personal charisma, or strategy to take down Lusitania on his own. 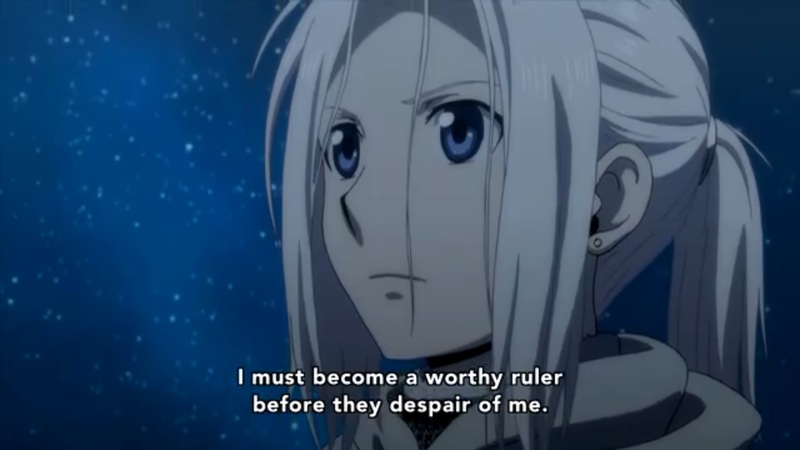 If he did, he wouldn’t be trying to control Arslan once he’s King, he’d just go take the throne by force himself. 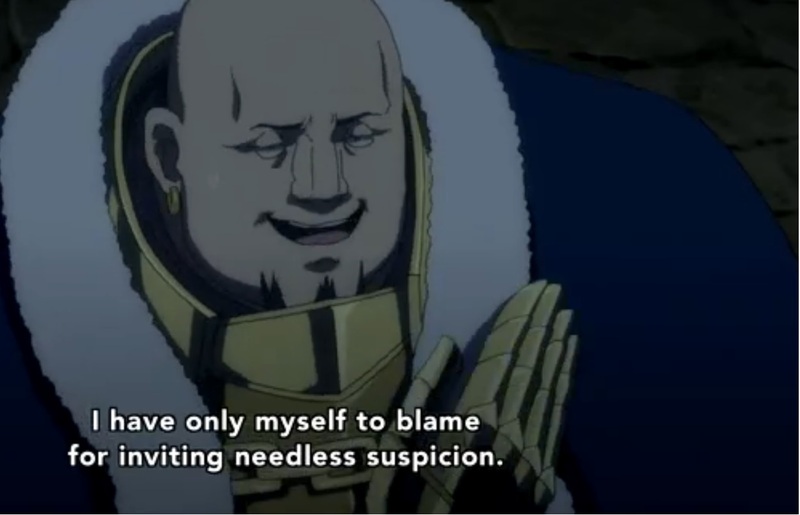 Finally, what are Arslan and company thinking when they leave the fort? They’ve killed its leader, and now they just ride away? They leave behind a sizeable armed force with no leader, a highly defensible fortress, and a whole bunch of people that know what Arslan and all of his companions look like, as well as their troop strength (six). It seems like a pretty big liability and a bigger missed opportunity, but no one even mentions it. Where will they go once they’re free? How will they eat with no money and no job? Who is going to believe that the prince in exile freed you, especially since he rode off immediately afterwards? He’s still incredibly, almost unbelievably, naïve, and all he gets from it is another lecture from Narsus. 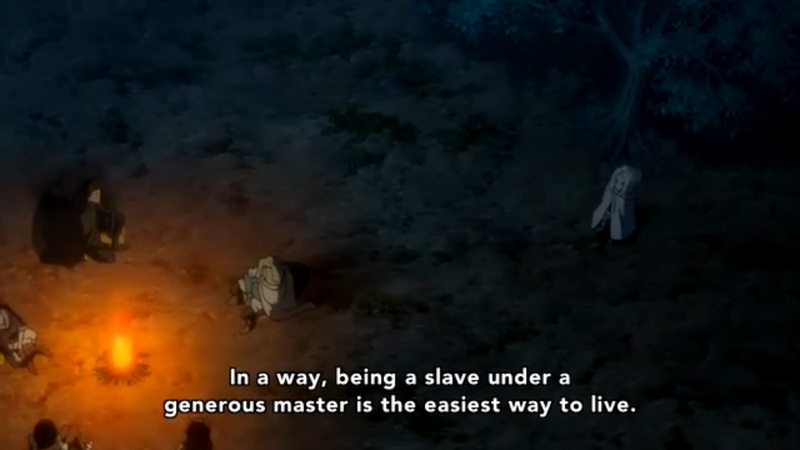 It’s a good lesson for Arslan, but it feels really forced, like we want him to have some character development but can’t figure out how to make it come naturally. While the specifics of the episode don’t hold up to scrutiny, it’s still a good enough episode, with action and cunning in equal measure. As the title picture shows, Arslan is at least aware that he needs to get better at this leadership thing, and it seems like that’s what he’ll be getting over the next few episodes. The animation quality was generally good, though there seemed to be a lot of problems with Hodir’s face and his movements when he was in armor; still an overall improvement from recent episodes.